Begin by cooking your noodles according to the package directions. I like having my noodles cooking right from the start so I can work on the cheese sauce while I wait for the noodles to cook. Patience is not my strong suit, so if I can do something to minimize waiting time I’m all for it. While your noodles cook, we start the cheese sauce. You’re going to make a roux as a base for the cheese sauce, which will help you make a really smooth sauce. To make the roux, begin by melting the butter in a saucepan. Stir in the flour until it is completely mixed with the butter. Slowly stir in the milk. Stir the roux for 3-6 minutes until it begins to thicken. Look at you making that roux. You’re amazing. Stir in the cheddar cheese, one half of a cup at a time. Let it melt completely before adding more cheese. Do the same thing with the Gruyère. 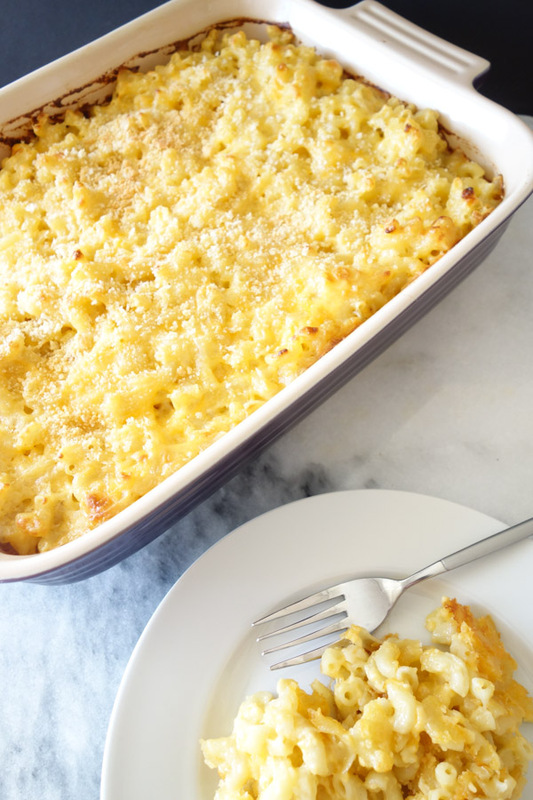 Since Gruyère is pretty soft, you may not be able to successfully grate it into the cheese sauce. If you can’t, just dice it into small chunks and add it to the cheese sauce while stirring continuously. Stir in the seasonings. Make sure to taste the cheese sauce to make sure it is to your liking. Want more cheese? Go ahead, add some more. You’re the boss! At this point your noodles are cooked, drained, and ready for their best friend, the cheese sauce. Butter a casserole dish or spray it with non-stick cooking spray. Add the noodles. Add the cheese. Make some magic. Stir the cheese and noodles until evenly mixed. 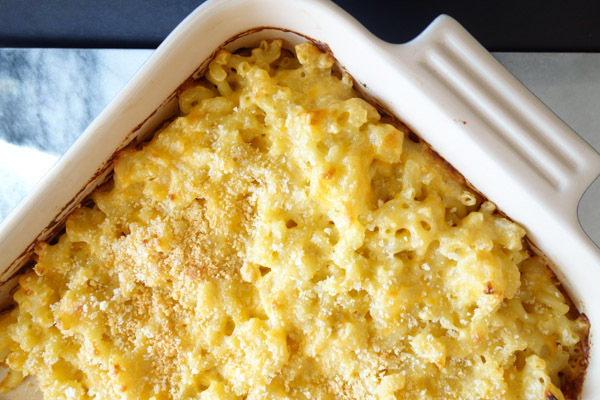 Here’s a busy life tip for you: if you’re in a hurry, skip the next step and serve the macaroni and cheese without baking. It will still taste delicious. In a small bowl, mix the bread crumbs and Pecorino Romano cheese. Spread bread crumb mixture over the noodles. Bake in a 350 degree oven for 20 minutes or until the edges begin to brown. Serve it hot and try not to burn your tongue because you probably will not be able to wait long enough for it to cool down. Cook noodles according to the package directions. Drain and set aside. Make a roux by melting the butter in a saucepan. Stir in the flour until it is completely mixed with the butter, about one minute. Slowly stir in the milk. Stir the roux for 3-6 minutes until it begins to thicken. Stir in the cheddar cheese, one half of a cup at a time. Let it melt completely before adding more cheese. Stir in the Gruyère cheese. If unable to grate the Gruyère, dice it into small chunks and add it to the cheese sauce while stirring continuously. Stir in the seasonings. Butter a casserole dish or spray with non-stick cooking spray. Add the noodles and cheese. Stir the cheese and noodles until mixed evenly. In a small bowl, mix bread crumbs and Pecorino Romano cheese. Spread bread crumb mixture over the noodles. Bake in a 350 degree oven for 20 minutes or until the edges begin to brown. Never EVER enough cheese. Wise words! You had me at cheese!!!! !